Before you can stop doing something, you need to be aware that you are about to do it. This is the cornerstone of habit reversal therapy. 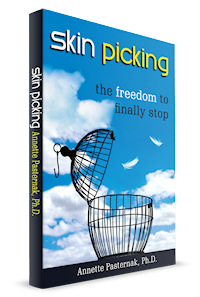 Compulsive skin picking can have a debilitating effect on the life of the person who engages in this behavior. Not only does is inflict physical wounds to the skin, the emotional impact can also have a ripple effect on the individual’s life. Many people who have what is known as Dermatillomania, or more recently Excoriation Disorder report feeling extreme guilt and shame about their behavior, but more importantly their inability to stop doing it despite wanting to. People who compulsively pick their skin do not do so with the intent to cause bodily harm, it is one of the features that distinguishes Dermatillomania from self-harm. However, for some the urge to pick is just too strong to resist, while for others there is not identifiable urge because they start picking without realising it. Ever caught yourself doing something without realising you were doing it? Most of us have little habits and mannerisms, be it a doodling on a piece of paper, or shaking your leg while sitting. It is a harmless action we engaging in not deliberately, but rather subconsciously triggered by some sort of stimulus, like boredom or when trying to think. These are all harmless, but when the action becomes destructive to our physical or emotional wellbeing, it is important that the behavior be addressed. In the field of body focused repetitive behaviours (BFRBs), this type of behavior is classified as automatic, whereas premeditated picking is classified as focused. People who engage in automatic skin picking often start picking their skin without realising it. The problem is that by the time they realise they had been picking it is incredibly difficult to stop, with many people describing it as feeling like being in a trance-like state. How do you stop picking if you don’t even know when you start picking? Cognitive behavioral therapy (CBT) is documented as the most effective treatment strategy for people with BFRBs. One of the core characteristics of CBT is that it encourages the individual to pinpoint what triggered the urge or the behavior in the first place. Once you identify the triggers, there are tools and strategies that can be employed to avoid or prevent being exposed to those triggers, known as stimulus control; or redirect responses to those triggers known as competing responses. It is for this reason that cognitive behavioral therapists will ask their clients to keep a picking log. It helps the client develop awareness of the picking, but also helps the client identify what triggers the urge to pick in focused picking, and what triggers the act in automatic picking. Unfortunately, despite the importance of this exercise, keeping a picking record is not easy. Many clients find it cumbersome, unpleasant and often forget to write down all the information they are required to record. In our interactions with clients in our online therapy course we recognized this as a real barrier to progress in treatment. And thus the SkinPick Self-Monitoring App was created. We live in a digital world, never far from our technological devices. 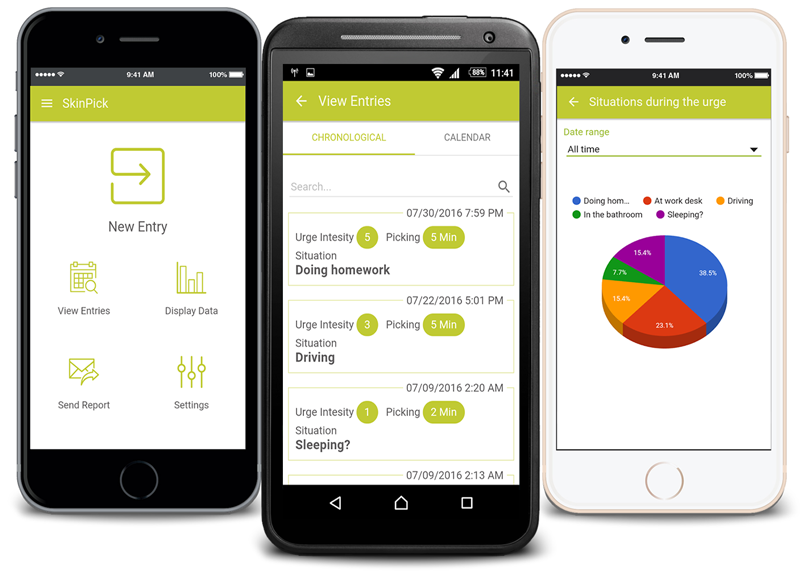 This free mobile app enables the you to record your picking behaviors quickly, securely and on the go, and is available on both Android and iOS. This information can then be exported and sent to your therapist where you and your therapist will be able to discuss and reflect whether there is a pattern to the types of situations where you usually pick, the times of day you most frequently experience urges or tend to pick, and the body areas most commonly affected. Aside from the benefits to treatment, those who have already started using the app have reported that just using the App has led to significant decreases in the severity of their picking. 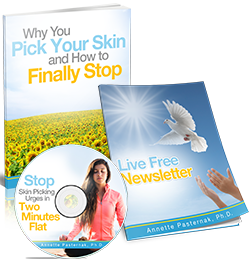 Before you leave, write your name and email in the box on the upper-right of this page to get your free Freedom Kit to learn Why You Pick Your Skin and How to Finally Stop, and How to Stop Skin Picking Urges in 2 Minutes Flat.